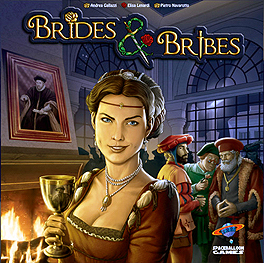 In Brides & Bribes, you and the other players try to outmanoeuvre one another as scheming noblemen in Renaissance Genoa. Starting with a handful of loyal family members and few resources, you will struggle to become the new Doge, Lord of Genoa, and the most powerful family in the city. Each turn you will send your family members to the Genovese boroughs to hire new employees, get new workers, increase your fame, and convince the local lord that your family is worthy of a marriage with his beautiful daughter!